The Raiders climbed to the top of the North Coast Premier League Football Competition in two divisions last Wednesday night after the Reserve grade ran out 6-1 winners over Coffs Coast Tigers vaulting them past Northern Storm and into top spot and the first grade a solid 4-1 win over the Tigers at Polworth Drive sliding them past arch rivals Coffs United with 5 rounds remaining. Head coach Paul Pomroy beaming at fulltime pleased with the efforts of the lads after a hectic schedule of recent matches that has tested the depth of the club. The win always looked likely after the Raiders found the net early via Joseph Andrew Pettit who unlocked the Tigers defence on 6 minutes to give the visitors the early lead. With a glut of possession, the Raiders were not able to increase the lead (although they tested the integrity of the woodwork a few times) before the break but certainly pressured the well drilled Tiger defence led by veteran Dane Dixon. The Tigers afforded few opportunities in the first 45 and had toiled so hard, at 1-0 down must’ve thought they were right in this and so it was minutes into the second stanza and a blazing shot from 20m smacked off the underside of the Raiders crossbar ricocheting into the net to restore parity. The Raiders, they don’t concede too many goals these days, leaking only 7 goals in some 13 starts but at 1-1 thoughts of their recent slip V Northern Storm (1-1 in that one after a late Storm equalizer) swirled around Polworth Drive like zephyrs of warm air. The Raiders though built of stern stuff these days, produced a barrage of unrelenting attack that the Tigers struggled to repulse. 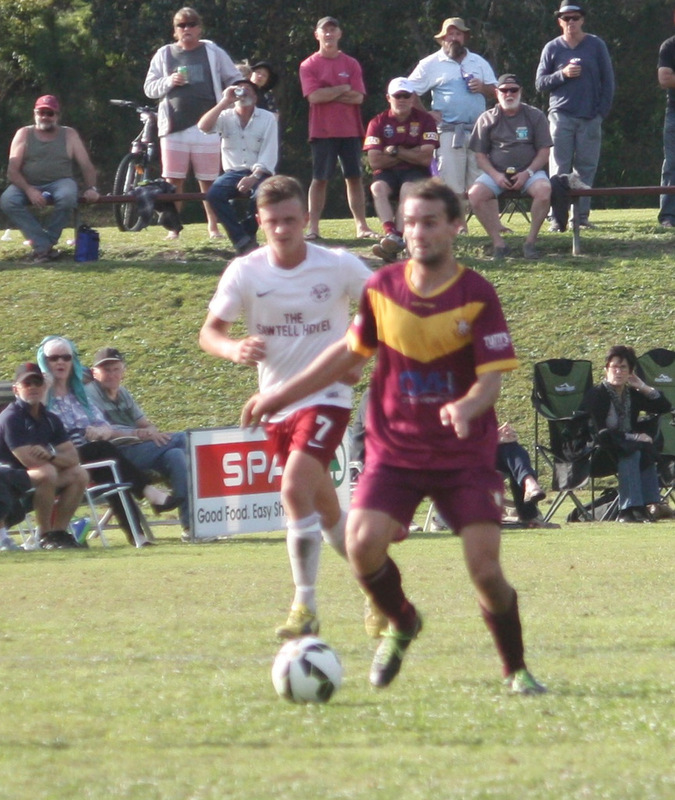 Urunga’s Joey Pettit into the side (courtesy of Fabrice Wamara’s dickey knee) reveling in his first start in the top flight for some time smacked in a goal that he’ll long remember from 23m to give Pomroy’s side a 2-1 lift. Not home yet though for Urunga, the points perhaps still in the balance but Pettit’s strike had an immediate effect on proceedings. The Coffs Tigers who’d been attacking, albeit sporadically looked a tad deflated, and after Pettit’s sublime strike sank back to defend and maybe score on the counter. That plan evaporated only minutes later after Tim Ruprecht finished off a delightful Raider move instigated by Kale Hopper and absolutely slaughtered by Ruprecth from close range for 3-1. If the result at that point was still in question it was answered via the right foot of one Craig turtle Simpson 14 minutes from time. The ‘turts’ as he is affectionately known among the Raider faithful had weaved past a poorly timed challenge bounced a ball off Kale Hopper and slotted past a diving Tigers keeper from 17m to make it 4-1 and contest over. Good result for the Raiders who have settled back into a winning rhythm at the right end of the season and now atop the table! In the earlier result the Reserve grade had a solid 6-1 win after an early hiccup conceding after 2 minutes but settling to go on with the job.